The United States requires passports for all air travelers to the Caribbean islands including the Bahamas. Non US citizens require the appropriate documentation for US re-entry. Please consult the following passport resource for further information. Seasonal weather conditions and temperatures can vary from island to island. In general, hurricane season is from mid June through November with minor variances. Rainy seasons are localized based on the location and geography. Sandals Resorts includes roundtrip airport transfers within its packages. Transfers are included no matter if airfare is purchased through Sandals or purchased individually. After the resort balance is paid in full, vouchers will be mailed or emailed to be brought along on your travels for the transfers and resort check-in. After arriving at the destination airport and proceeding through customs, simply go to the Sandals desk or Sandals lounge within the transportation area in order to be placed on a shuttle to your resort. Please note that airport transfer drivers are not Sandals employees and tips are greatly appreciated. Airlines from North America to Montego Bay: Air Canada, Caribbean Air, Southwest/Airtran, American, United, Delta, Jet Blue, US Airways, Frontier, Spirit, Virgin Atlantic, Condor, Copa, Sunwing. Airlines from North America to Nassau: Southwest, American, Bahamas Air, United, US Airways, Jet Blue, Delta, Air Canada, British Airways, Copa, Caribbean Airlines, SkyBahamas. Sandals Royal Bahamian Resort is located on Cable Beach less than 15 minutes away from the Nassau International Airport (NAS). Airlines from North America to Georgetown: Delta, American, Air Canada, US Airways, Bahamasair. The airport for Sandals Emerald Bay is Exuma Intl Airport (GGT). Traveling to this airport will usually involve a connection flight for most travelers. Gateways are Miami, Atlanta, and Nassau. The resort is located less than 15 minutes away. Airlines from North America to Antigua: Air Canada, American, United, British Airways, Caribbean Airlines, US Airways, Virgin Atlantic. All Antigua flights go through V.C. Bird International Airport (ANU). Go through customs and proceed to the Sandals desk. Sandals Grande Antigua is located 15 minutes away. Airlines from North America to St Lucia: Air Canada, American, Delta, Jet Blue, US Airways, British Airways, Virgin Atlantic, Caribbean Airlines, Air France. Traveling through St. Lucia can often have the option of two airports. Most flights travel through Hewanorra International Airport (UVF) which is approx 2 hour drive to the resorts. Smaller planes (usually involves connection thru San Juan) can land at Vigie Airport (SLU) and be approx 15 minutes to the resorts. Traveling through St. Luica is along a series of single lane curved roadways, but very scenic including mountain and rainforest travels. Airlines from North America to Barbados: American, Jet Blue, Air Canada, Virgin Atlantic, US Airways, British Airways, Caribbean Airlines, Condor. 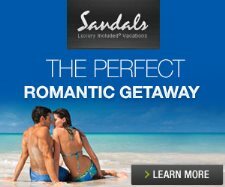 Sandals Barbados is located 15 minutes away from Grantley Adams International Airport (BGI). Airlines from North America to Grenada: American, Delta, British Airways, US Airways, Air Canada, Virgin Atlantic, Caribbean Airlines. Sandals LaSource is located along the southern tip of Grenada and 5 minutes away from Maurice Bishop International Airport (GND).